On Monday and Tuesday this week, Johannes and Thomas took the electronics to the Electrical Engineering Department of the University of Glasgow to perform the first thermal test of the experiment. Malcolm joined for a couple of hours for support as well. REXUS/BEXUS requires thermal tests that should validate Suaineadh’s performance for the environmental conditions that the experiment has to withstand in Kiruna and on its way to space. The minimum temperature required by REXUS/BEXUS is -10C and the highest is +45C, the experiment has to work without a problem for at least 15 minutes. The fist thermal test performed included the mechanical parts that could experience problems at lower or higher temperatures. Therefore the reaction wheel, the linear guide rails, the release spine, the web and the wave spring got tested. All the components worked nominal after the freezing and heating. 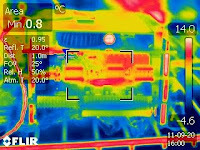 The second thermal test included the electronics of Suaineadh. The electronics were booted up at room temperature and then the chamber was cooled down to -10C and the temperature was held for 15 minutes without any problem, everything worked nominal. In the next test the entire electronic was turned off and let cool down until all the components had ambient temperature (-10C). During the cold start, all the electronics turned on but the ground support software didn’t get any readings. The Suaineadh team is looking into this error at the moment in Stockholm and Glasgow to eliminate the source. Another thermal test of the entire experiment is planned for mid October anyways. The following test, where the components were heated up to +45C, was carried out without any problem. Even a hot restart at these temperatures didn’t showed any problems or anomalies.